When selling products Online one of the most important aspects for your customers is the shipping method that will be used for the purchased product to be shipped to them. 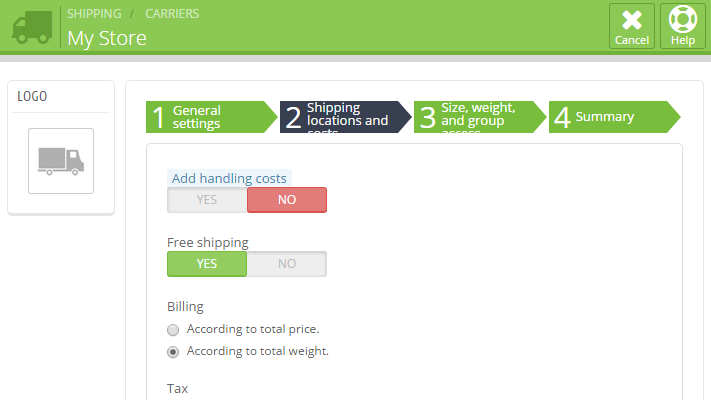 PrestaShop 1.6 provides you with an easy way to add carriers which are automatically shown as shipping methods for your products and in the next few lines of this tutorial we will show you how to add and configure shipping methods. As we have mentioned the payment methods are nothing more than configuring the correct carrier. In order for this to happen you will need to first access the Carriers page which you can find the Back office of your Store and then by navigating to Shipping>Carriers . 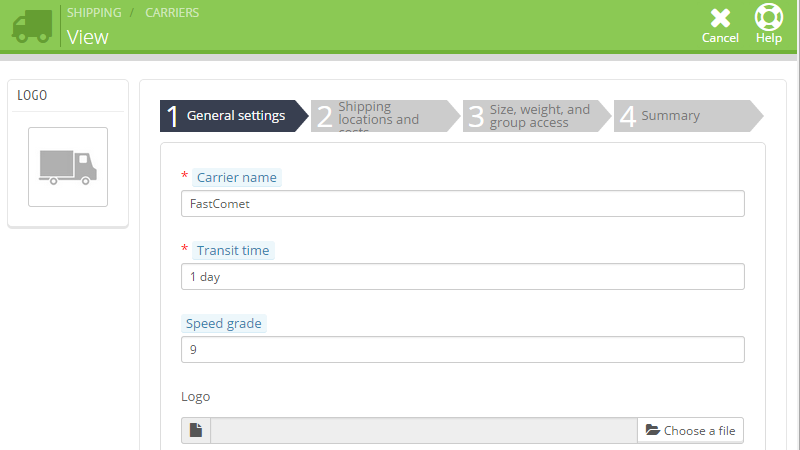 Next you will be redirected to a page where you will be able to see a list of the already configured carriers. 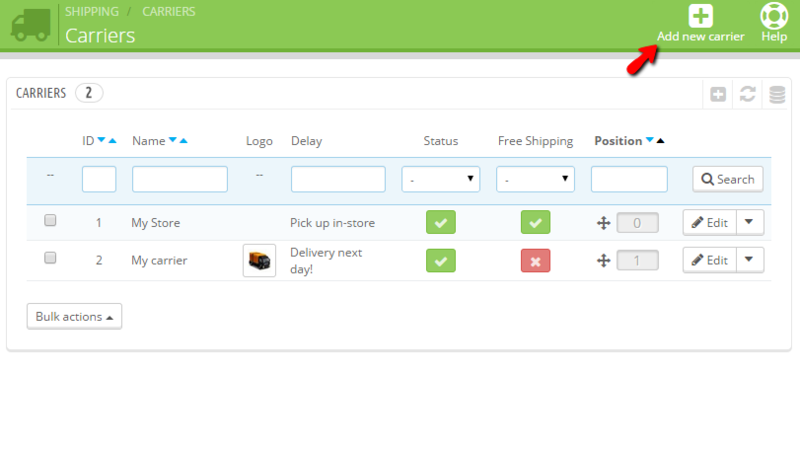 With the default setup of the PrestaShop 1.6 platform you will get a total of two predefined carriers. These are only for sample purpose and you can remove them if you are not going to need them. Now let’s add a new carrier. 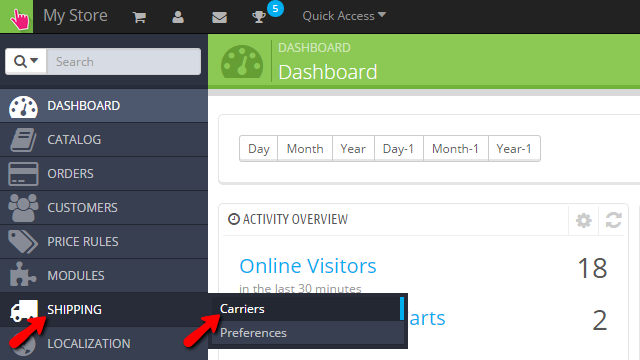 In order to do so you will need to click on the Add New Carrier button located at the top action bar of the page. 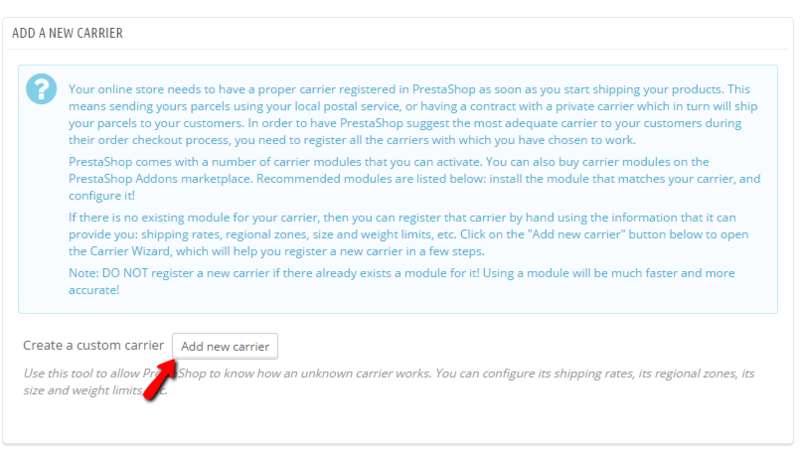 On the next page you will be presented with a detailed description of the carriers and the availability of large variety of such modules in the official PrestaShop 1.6 modules marketplace. Bellow the large description box you will find the Add new carrier button which you should use in order to start the process of adding a new carrier. Once you are done with the configuration for this first step please click on the second step so you can proceed with the configuration. The third step of the configuration for this carrier is the “Size, weight and group access” step. Here you will find configuration options related to the limitations for the packages this carrier will be shipping from your store to your clients. The configuration options are quite self-explanatory and you will be able to adapt to those quite easily. The final step with configuration options is called Summary and there you will be able to see a brief summary of the configuration you have just performed. 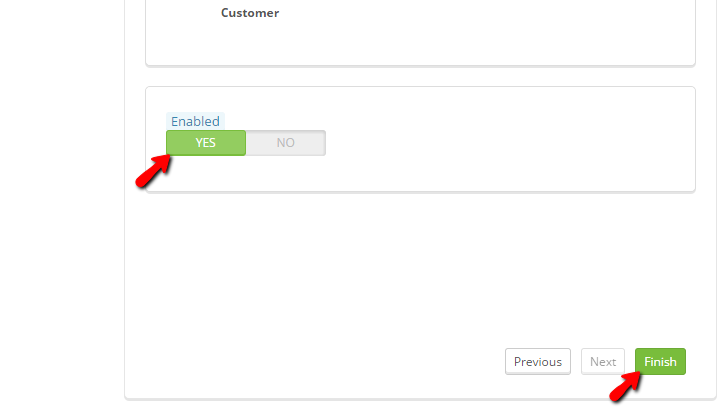 At the end of the form you will see the Enabled option which will actually provide you with the option to directly enable or disable this carrier. Now that you are done with these options it is time to save the new carrier and to use it for the shipping of your products. In order to save all those options for the new carrier simply click on the Finish button and the carrier will be saved successfully. Congratulations! 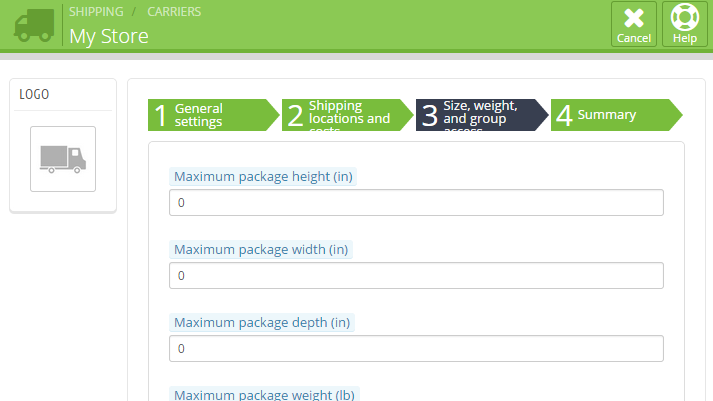 You can now configure as much as carriers you would like to for your products!